French guitar master Cyril Achard has been absent from the rock scene for nearly seven, but he has been busy. Much like American Alex Skolnick (Testament), Mr. Achard has been exploring his jazz guitar interests with his own internationally recognized jazz trio. Yet, his roots in rock and metal guitar, particularly the shred variety, run deep. With the aptly titled Violencia, Achard rips up the traditional, and acceptable, vision of that platform. Like his jazz band, this work is built around a trio including, from Adagio metal band, bassist Franck Hermanny and drummer Eric Lebailly. Additionally, the sound of Violencia is brash and raw, no overdubs were used with Achard's work. The tone is nearly a basement or garage ready atmosphere. However, besides the brilliant rhythm section and ballsy sound, the brilliance is in Achard's fret work. Certainly, his shred guitar mastery is evident, but his seven years of exploration into jazz guitar resounds on every song. Violencia is honest, inventive, and bold rock and metal guitar energized by Achard's jazz infested ingenuity. While the whole album burns with intrigue, my favorites included Brutalize, Saint Hetfield, and Sweet and Furious. Bottom line: don't miss this one! 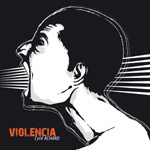 Violencia is honest, inventive, and bold rock and metal guitar energized by Achard's jazz infested ingenuity. Bottom line: don't miss this one!